Lavender fine, also known as Lavandula angustifolia, is an aromatic herb that is native to the Mediterranean. Lavender is up to 1 meter high, the whole plant is highly aromatic. Lavender has a range of over 100 ingredients and is considered the "oil of the Middle";. It is found in the naturopathy application for skin problems, insomnia, tension, muscle, digestive and respiratory symptoms in the gourmet cuisine, it is used for delicate refine dishes and desserts and in perfumery it is a valued commodity. Application: Mix max. 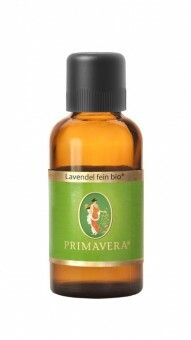 12 drops with 50 ml Primavera almond oil. ** Natural components of essential oil.